It’s been a busy week since I last posted – I’ve been preparing materials in order to sue the Los Angeles County Child Support Services Department for their theft, fraud, and other vile actions. 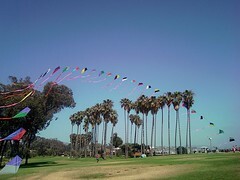 I did; however, get down to Doheny State Beach where I sat on the grass for a couple of hours in order to add the tails to my arch kite. To say that I was pleased with the results is an understatement – I was absolutely thrilled with the results! I still can’t believe that I’m actually making so many cool kite things – sewing has turned out to be a bit easier than I imagined and I’m having a ball with it. 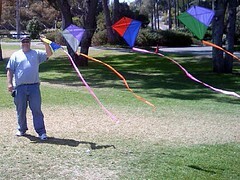 If nothing else, it’s great “therapy” and is quite inexpensive (far, far cheaper than buying kites). It only took a few moments after I launched the arch (I was a bit worried as I had read that arches can turn into a tangled mess if they’re not launched properly) before others started coming over to comment. One guy offered to take my picture, using my cell phone, while holding on to the end of the arch – granted, the clown in the photo kind of spoils the picture (grin) but the kites sure look great! As I alluded above, I had no problem launching my kite arch – the picture shows the arch in its full glory. It also shows how they were constructed – each kite has one spar (the vertical one), and the horizontal “spar” consists of Dacron line that is sewn across the back. I used Dacron tape to make the spar pockets (note the kite near the bottom left) and surveyors’ tape is attached to the bottom of each kite, using Velcro, to serve as a tail. The breeze was somewhat irregular; however, and the arch would go up – and come down. One of the interesting things is that the arch would self-launch when the breeze would pick up again. As a result, there where times when only a part of the arch would be aloft while, at other times, all of them would reach towards the sky and pull the line taut. As always, I had the most fun watching others enjoying the kites – seeing their reactions is almost as fun as flying. 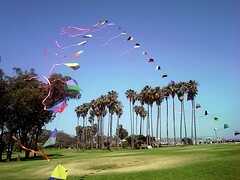 Previous Previous post: 90 Feet of Kites!